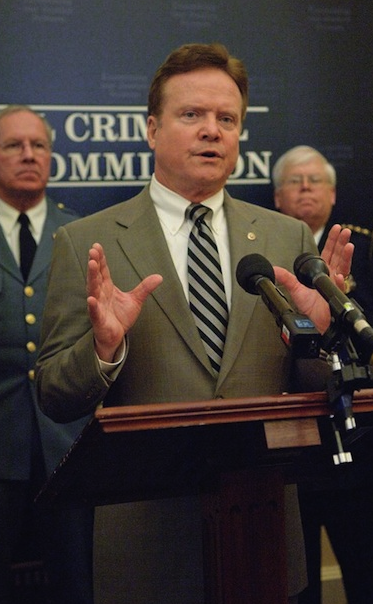 The legislation, introduced by Senator Jim Webb on March 26, 2009, was voted out of the Judiciary Committee Jan. 19, 2010 and awaits a final vote on the Senate floor. The Goal is comprehensive review of our criminal justice system with an establishment of a national commission with a 18 month time line. Here are the latest press releases on this bill from Mar. 9, 2010. That same day a photo shoot took place following Webb’s address to the international association of the Chief of Police. Finally for those who missed the bill’s introduction; here’s Webb’s 2009 address on the senate floor outlining his justification, where he talks about drugs, addiction, mental illness and incarceration. He points out that starting in 1980 we had 41,000 people in prison for drug offenses and now we have over 500,000 people in prison for drug offenses. He says we have 4 times as many mentally ill patients in prison than we do in mental institutions. We have gangs in 230 cities; not just on our borders! He talks about finding ways to reduce the population in prison and at the same time protecting our communities. We all need to stoke the fire under Senator Webb. Update by Mary S.
Thanks for keeping us posted. This is sooooooooooo important. I hope that, after the bill is written into law, that awareness of the plight of rehabilitated long-term lifers will be addressed. There is a handful of states, including my home state of Illinois and also Pennsylvania, who implement a “life means life” policy of life WITHOUT ANY POSSIBILITY OF PAROLE. This policy and the philosophy behind it denies the possibility of redemption and rehabilitation that is the reality in terms of many lifers all over the United States. Please visit this website: theotherdeathpenalty.org. I am on the committee of a very deserving lifer who is seeking clemency in Pennsylvania. His name is Robert Wideman and the website regarding the situation of Mr. Wideman and his efforts is: freerobertwideman.org.